Swedish Lapland is magical in the winter. Snow that sparkles like a sea of diamonds, spotting herds of reindeer, trees so heavy with snow that they dip precariously toward the ground, and green curtains dancing across the night sky. There’s a thrill to stepping off the plane at the tiny airport and spotting the negative temperatures displayed on the sign welcoming you to Kiruna. It might sound absolutely crazy to go to a place so cold that you’ll quite literally feel your eyelashes freeze, but the experiences are unforgettable. One of the greatest and most spectacular natural phenomena on earth, it seems every traveler has put witnessing the green curtain that seemingly billows across the Arctic night sky on their must-see list. We get it. We’ve had the good fortune to see the Northern Lights more than a dozen times now in four different countries and we’re still always planning our next trip to go chasing them. Even the teeny-tiny town of Abisko, shockingly, puts off a lot of light pollution. And when you’re chasing the Northern Lights, you want as little light pollution as possible for the best viewing. 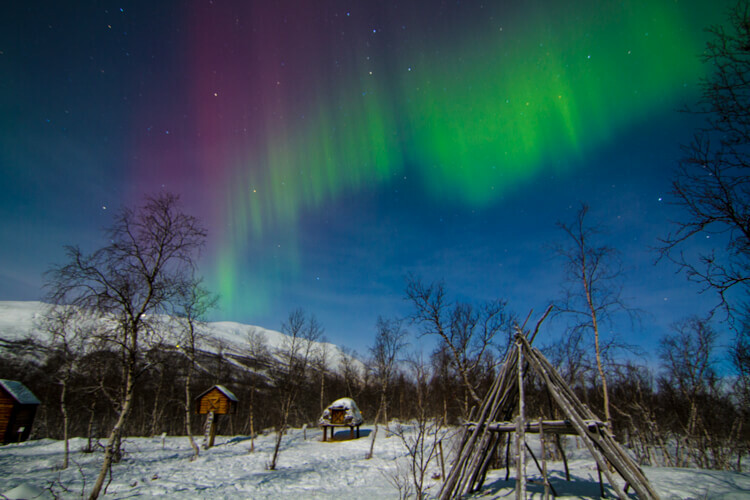 Lights Over Lapland, the premier Northern Lights tour company in Swedish Lapland, offers excursions to the Aurora Sky Station. Each night a small group of guests that opt for the Aurora Sky Station Exclusive Dinner are whisked up the mountain to 900 meters by chair lift. After the 20-minute ride, being welcomed with hot mulled wine with a shot of cloudberry liquor warms you right up. The chef prepares the dinner in the open-style kitchen impressively on a stove no bigger than the one you have at home and our small group enjoyed the 4-course while the chairlift operator keep a Northern Lights watch for us. The menu is a set menu as all ingredients have to be brought up via the chair lift and you can opt for wine or beer pairings (not included). After dinner, more guests begin arriving and there are short guided tours that give you some interesting facts about the Northern Lights and show you around outside. Climb the observation tower and if you can hold still for five minutes, the Aurora Sky Cam snaps a photo that you can view on the Aurora Sky Station website. Though our night up at the Aurora Sky Station was a rare completely cloud covered night and we eventually gave up on the Northern Lights, we still had a wonderful meal in a very special place. The Northern Lights are never a guarantee, and you’ll never spot them if you simply don’t go outside and look. The great thing about keeping watching from the Aurora Sky Station is that you have a warm place to hang out and with staff and other aurora hunters keeping an eye out, you’ll be sure not to miss them if they appear. If you think the best way to enjoy Swedish Lapland’s wintery landscape is to sit by the fire and gaze out the window, think again. Bundle up, get outdoors and conquer the snowy terrain with a team of huskies. The moment that the barking stops as you ease your foot off the brake and the dogs can do what they were born to do is a moment that you’ll never forget. The Pinetree Lodge, which actually started out as a husky kennel offering dog sledding tours in Swedish Lapland, is located in the middle of the forest. The owner, Johan, started the company after spending a year in Alaska in quite literally the middle of no where (the nearest town was 700 kilometers away) and learning to mush with his own sled dog team. Now Johan and his guides take great joy in taking people like us out in to the wilderness with the dogs. With 107 Alaskan huskies, it’s quite the orchestra of howls, whines and barks when you arrive in the morning. Everybody wants to go! There’s jumping and tugging punctuated with more barks and howls as us humans get ready to go. We’re clearly not moving fast enough if the whines are any indication. Just as a maestro’s baton silences a philharmonic orchestra, taking your foot off the brake silences the deafening cries in an instant. We sledded across frozen lakes and rivers, picked up speed in the open expanses, and ducked for cover through tunnels made by the snow-covered trees bending in arches over the narrow trail. Even though the temperatures were hovering around -20°C, helping the dogs by pushing the sled up hills keeps the blood flowing. I rode in the sled with our group’s bag of firewood, which we’d be using to make a hot lunch, and just sitting in the sled gets cold after a while. But even with my toes going numb, there’s just nothing like bouncing along in the blue light as the snowflakes gently fall. We covered about 40 kilometers on our full day dog sled adventure and stopped midday for a lunch we cooked in the forest. Back at the lodge, a hot sauna followed by sitting in front of a crackling fire never felt so good! Though the main activity at Pinetree Lodge is dog sledding, there are numerous other winter activities offered. Dog sledding is a really peaceful experience that makes you feel at one with nature. Snowmobiling, on the other hand, is exhilarating as you zig-zag across the snowy landscapes. Innumerable tunnels created by the tree goblins (trees so snow covered that they no longer resemble trees) open up onto frozen lakes that offer heart-racing opportunities for speed. There is absolutely nothing like watching the sun peek above the horizon for the first time in several weeks from the middle of a frozen lake. Even though sunrise and sunset all happened within 15 minutes, our snowmobile group forgot the cold and were all completely mesmerized by the golden glow. A beam shooting straight up in to the sky above seemed to emanate from the forest. Our guide, Victor, assured us that it wasn’t our eyes playing tricks on us. Seeing the beam is as rare and special as seeing the Northern Lights dance in the Polar Night. 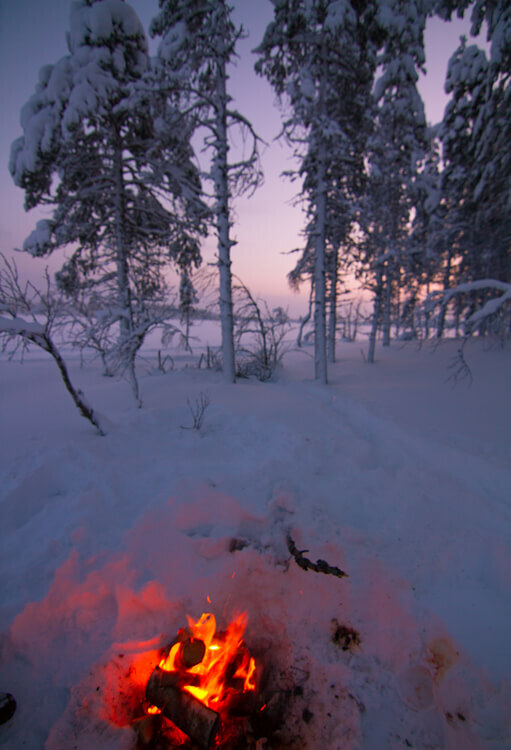 Like our full day dog sledding tour, we cooked a hot lunch over a fire Victor expertly built. This time we stopped out in the marshes on a large frozen lake dotted with islands. You never know what soup the cooks from the Pinetree Lodge send and we were all pleasantly surprised with the vegetarian chili. And I don’t just say that because it was -24°C; that chili was the perfect amount of spicy and I think I could have gobbled up the entire pot myself! We covered twice the ground we did dog sledding, traveling about 80 kilometers on the full day snowmobile tour. It was fantastic seeing parts of the forest we didn’t reach on dog sled and really awesome to spot some dog sleds making their way. Located 200 miles above the Arctic Circle and situated in the small village of Jukkasjarvi, each year the IceHotel is completely reconstructed from the ice from the River Torne. 2015, when we visited, was the 25th celebration of the world’s oldest ice hotel and they certainly went all out. We’ve actually stayed in igloos on several occasions previously at a ski resort in Slovenia and just under the Matterhorn, but we were blown away by the size and intricate details at Sweden’s IceHotel. From the moment you pull open the wooden doors by their reindeer antler handles, you’re presented with a feast for the eyes. Etchings of various animals like skateboarding bear and a rollerskating reindeer adorn the walls of the lobby and a chandelier completely made of ice cut into shapes to look like Swarovski crystals dangles in the main hall. From here you really take in the sheer size with multiple hallways branching off from the main hall. Each is lined with room after room, each art suite 100% unique and created by renowned artists. During the daytime, these suites are all open for guests and visitors to wander through. It was truly hard to pick a favorite! From a suite dubbed Polar Night with a lynx and howling wolves to days gone by in the Polish countryside inspired Borderland Suite, I wanted to stay in them all. “But isn’t it really cold?”, some of you asked on our Facebook Page when we posted live photos. Actually, it was around a teeth-chattering -20°C, snowing and windy the day we spent there, so the -5°C inside the hotel was a welcome respite from the blustery weather outside. The worst part about staying in an ice hotel or igloo is if you need to use the bathroom at night. Remember that these hotels are completely made from snow and ice, so there is not plumbing nor a bathroom. If you need to use the bathroom in the middle of the night, it is a cold dash from the comfort of your cozy expedition sleeping bag to a bathroom in another on-site building usually 100 yards away. Aside from the main “building” of the Ice Hotel, there is also a chapel where you can have a wedding straight of Frozen. Or head to the ICEBAR for a drink of vodka right out of a glass made of ice. Try out the kick sleds or skis, which are also available for guests and visitors. You can also arrange a variety of activities from the IceHotel, including arriving or heading to Kiruna airport by dog sled. The Ice Hotel also has a regular on-site hotel with sauna, lounge and restaurant. We got out of the cold for a bit and happily warmed up with Arctic inspired hot cocktails and smoked reindeer ciabattas. If you’re not up for staying the night in a bed made of ice and topped with reindeer furs, you can still visit and tour the IceHotel. There are guided tours at 12pm and 4pm and cost SEK 325 (adult) and SEK 75 for kids 6-12 years old. Our base for our dog sledding and snowmobile adventures was three nights at the Pinetree Lodge, about eight kilometers outside the village of Kangos. The three log cabin-style buildings that make up Pine Tree Lodge are located in the middle of the forest, so there is no light pollution and you have great possibilities of seeing the Northern Lights. We loved that all of our activities started right from the lodge and that there were also cross country skis, sleds and snowshoes available for guests to use complimentary. We enjoyed hanging out by the fireplace in the main building for afternoon snacks upon returning from our day trips each day. Tea, coffee, cookies and a snack that varied each afternoon were complimentary, but you could also order other beverages from the bar. We couldn’t resist ording a sampler with reindeer, moose and cheese served with cloudberry jam every single one of our three afternoons at Pine Tree Lodge. We even bought some of the reindeer, which is nicely packaged and for sale in the small gift shop, to enjoy at home. Like our stay at the Abisko Turiststation, we were asked each day if we had any allergies. The closest hospital is a long way away, so the wait staff want to ensure everything on the menu is okay. The meal changes daily and everything we had was delicious. We also loved that we could order a bottle of wine and if we didn’t finish it, the restaurant would re-cork it and store for us until the next night. Dog sledding is exhausting after all and we had Northern Lights to stay up and watch for; a full bottle of wine would have put us to sleep! The saunas in the main building were also perfect for warming up after being chilled to the bone on our day excursions. In addition to the sauna in the main building, the more adventurous could use the sauna next to the lake and then take an icy dip in true Scandinavian style. A request just has to be made in advance so the sauna can heat up. Being out in the middle of the forest comes with its charms, and its challenges. We had a couple of power outages, one that knocked out the hot water and heat. I wasn’t thrilled that I couldn’t take a hot shower when we got back from dog sledding or before dinner, but a complimentary bottle of wine that the management offered took the edge of. 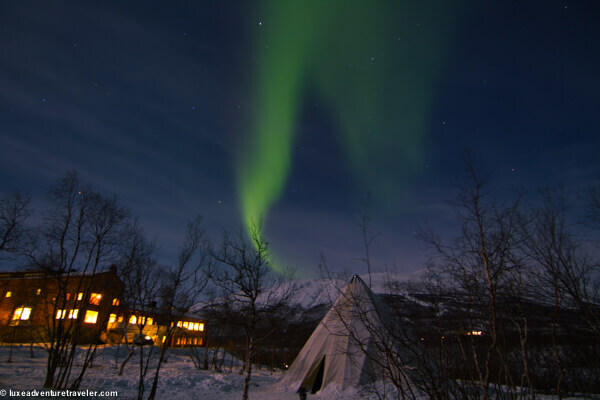 We recommend stay at Abisko Turiststation in Abisko National Park for 3 nights, IceHotel in Jukkasjarvi for 1 night and Pinetree Lodge in Kangos for 2 nights. 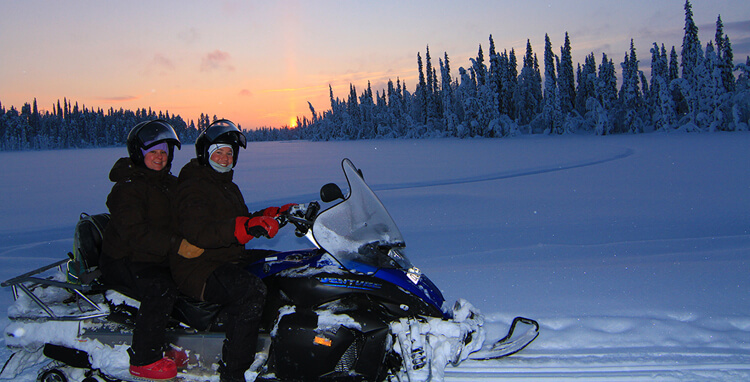 Dog sledding, snowmobiling and a variety of other activities can be booked at Pinetree Lodge or through Explore the North. Northern Lights tours can be booked through Lights Over Lapland. Book the Aurora Sky Station exclusive dinner online. 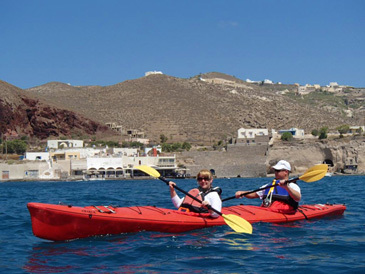 Warm Bergen’s clothing is provided for all excursions, so you don’t have to worry about purchasing or packing gear. We recommend bringing hand and foot warmers to keep warm on full day excursions. Both Abisko Turiststation and Pine Tree Lodge accept credit cards. Get cash at the airport as both Kangos and Abisko are very small villages with limited services. Our Aurora Odyssey trip to Swedish Lapland was provided by Abisko Aurora with the support of Lights Over Lapland in order to bring you this story. However, Luxe Adventure Traveler maintains full editorial control of the content published on this site. As always, all thoughts, opinions, and enthusiasm for travel are entirely our own. This article contains affiliate links. When you book on Booking.com through our affiliate site, we earn a small commission at no additional cost to you. It just helps us keep things running here at Luxe Adventure Traveler! You guys have had such amazing adventures, and the photos really tell the story. It makes me cold just to read about it! Wow, this sounds like the trip of a lifetime! Having lived in Alaska, I know very well how the northern lights can’t be seen on command. Even though my house was just outside the Fairbanks city limits, there was too much light unless it was a very active evening. I’d look at the University of Alaska’s northern lights predictions and on the nights that looked promising I’d step outside at just the right time in freezing temperatures to have a look. I learned after a month or so that I had to get way outside the city. It sounds as though you had a very enjoyable experience that evening nonetheless. Thanks for the post – love the ice hotel and food tray! Lapland looks magical. Hope I can visit there someday. Of course, I hate the cold, but with such a view, who am I to say no if such an opportunity arises? Great pics! A friend of mine traveled here a few years ago and it has been on my bucket list ever since! Gorgeous photos!! Lovely!! Makes me want to visit. My mother is Swedish and Finnish and I can’t believe I’ve still not been to either country. This is just incredible and unlike anything I’ve ever experienced. 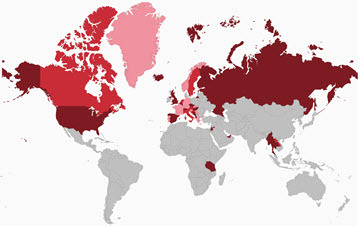 I have great-great grandparents from Sweden and have been to Stockholm but nothing beyond that. 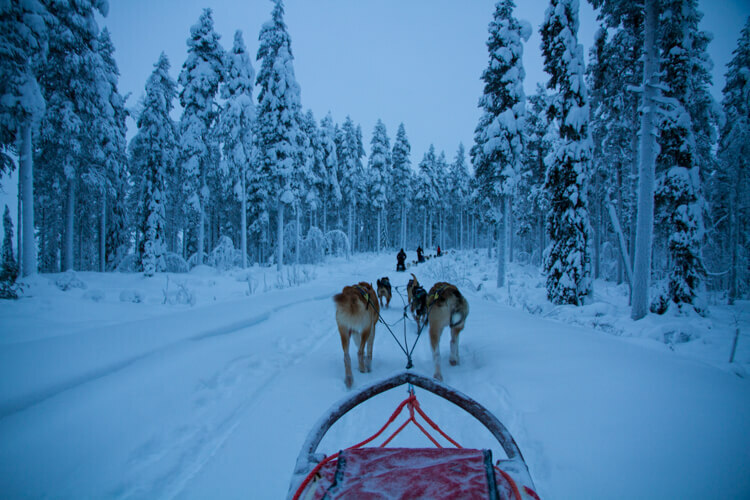 LOVE the pic of the dogs pulling the sled through the trees – awesome! Lapland is really beautiful – definitely have to go there in winter. Have you been in autumn? The fall colors are out of this world. You are SO the queen of winter travel. This looks awesome and all of these activities are on my bucket list … the dog sledding, the northern lights, sleeping in a frozen suite. Thank you for sharing tips on how to get there. I can’t believe I’ve never heard of an ice hotel! Thanks for the review – this looks incredible!